Regardless of when you last watched the movie Rocky, I bet hearing the theme song nonetheless makes you want to run hard, throw a few punches, and fling your arms up in victory. In the unlikely event you can’t call the song to mind, I promise by the time you finish reading this post you’ll have it firmly lodged in your head. But what about Rocky’s running? I know, he’s a boxer, not a runner, but there’s a lot to see in the famous montages of his running during training. So I’m going to analyze the montages from Rocky I and Rocky II so you can pick the right Rocky Balboa to copy when you’re out on a run yourself. This montage shows Rocky’s transformation in the first movie from loser to someone who can “go the distance.” (Good running metaphor, no?) 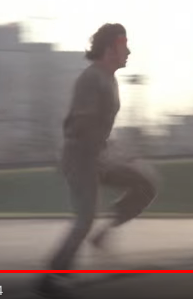 So in the first scene we see a guy who doesn’t look confident, and that defining quality determines his running technique, even as he becomes more fit. Right off the bat you can take a very practical lesson from the montage: don’t run with bricks in your hands. Notice how his forward and upwards punches make him pull his shoulder blades together (you can see the trough between them in his upper back at 0:11 when he’s shown from the back), pulling his upper body upright so he drops his head way down to counterbalance this. Not a good way to run, even for a boxer. Imagine boxing like this, head way forward but shoulder blades pulled back. 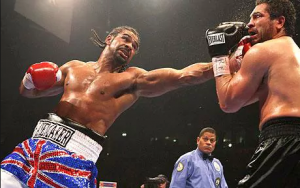 That’s not how it’s done, as the above photo of World Heavyweight Champion David Haye suggests. At 0:15 in the video you can see a large side-to-side movement of his shoulders and head, with the shoulders even tipping one way and the other. Though I’ve often written about the importance of a lateral weight shift in running, this is excessive for the upper body. You can sense it as well–it has a heavy, almost lumbering quality. Some of the reasons for this will shortly become clear, but for the time being we can assume when so much lateral shifting happens in the upper body, it’s a signal that not enough is happening with the pelvis. That forces the upper body to overcompensate. At 0:32, as he runs along the river path, you can see the soles of his shoes from the front. That’s never good. Although it’s not necessarily true that all heelstriking is bad, the amount you have to do to make the undersides of your shoes visible from the front is always excessive. And in fact, as the angle shifts and the camera pulls back it becomes clear he’s landing with a nearly straight leg stretched out in front of him, with the back of his heel meeting the ground and the front of the foot lifted high in the air. You can almost feel the burning in his quads and quite possibly the pain in his knees and shins as well. And his face confirms this. Ouch. You can also see how flexed his body is. He’s very hunched, almost in the fetal position. This gives a clue to why he has to throw his upper body from side to side as he runs: he can’t extend his body and leg through late stance to a proper toe off. Instead he stays flexed and, well, throws his weight side-to-side to make a stepping action instead. We see another reason for this upper body movement at 0:51: one-arm pushups. Second, that is the exact movement he’s bringing with him into his running. See how he bends his spine sideways, with the whole left side of his body lengthened, the left arm doing the pushup, his head to the right and his right leg almost turned outwards. He has to shift his weight like this to do the pushup with just one arm. This movement actually echoes the running stride: toeing off the left foot is basically the same set of relationships in the body, with the whole left side lengthened, the right side shortened, the left arm coming in front, the right arm back, and the right leg swinging forwards. Our bodies are made to work like this. …getting punched in the gut, as at 1:06, causes him to flex his torso including a posterior pelvis tilt (i.e. his pelvis is “tucked,” with the top tilted backwards, and his lower back in particular is somewhat rounded). All that punching that boxers do, for instance the practice with the side of beef at 1:17, just contributes to this organization. Punching doesn’t necessarily require being flexed but punching while trying not to get punched does. This habit, while apparently functional for a boxer and also a natural consequence of having a really sore abdomen from getting hit, will tend to fling the legs too far forward in running, leading to exactly the kind of stiff-legged hard heelstrike we’ve seen him use. And part of that organization is having the weight of the torso and head always a little too far back relative to the feet, so that a properly extended toe-off doesn’t ever really happen. And if you’re Rocky and thus do a lot of one-arm pushups, you do what you know how to do, namely throw your weight side-to-side instead. This is a great example of what all of us do in our running. We bring our movement habits with us. They may be a good fit for running, or they may be a poor fit. If the latter is true, this means you have to look deeper than just how you run to make the kinds of technical changes you need. At 1:39 we see Rocky accelerate along a wharf. At first he’s running with that astounding heelstrike we’ve already discussed. But note his straighter back, reflecting his increasing confidence and fitness. He looks a lot better than in the beginning of the montage. As his speed increases his leg action and footstrike shift. First he starts landing on more supple legs, with bent rather than straight knees. Then suddenly his footstrike shifts and he’s landing forefoot. Ta da! Good running form! Except, wait, isn’t it funny the way his head pumps forward and back? That’s what tells us that how he’s initiating and controlling his movement hasn’t actually changed. It’s just the speed and momentum that have changed how he’s moving. But his weight is still too far back and he’s having to use the muscles on the front of his body to keep pulling his head and shoulders forward–they’re not moving fast enough to keep up with the legs because they’re in the wrong place. Speed can hide technical problems but it doesn’t fix them. Then suddenly at 2:02 we arrive at the iconic stairs scene, as Rocky runs and jumps up the steps in front of the Philadelphia Museum of Art. But watch how flexed he still is, with his focus down, reaching out in front of himself and intermittently flinging his arms wide to propel himself upwards. This takes me back to my observations about Aragorn in my running form analysis of Lord of the Rings a couple of years ago. He bounces on his forefeet when he reaches the top, and then–the final thrill–throws his arms in the air. At that moment, 2:19, watch how he suddenly bounces even more forward on his feet, quicker and more lightly. Even though his head is down, he’s extending his body and that effect travels all the way down to his more plantarflexed feet, part of an overall pattern of extension. You can see immediately that he’s less flexed, with his back less rounded, his shoulders less hunched, and his head up and forward, setting the forward direction for his body (more about that here). At 0:23, running through the market with the boxes of veg it even looks like his shoulders are tipping a bit less side-to-side, another good indication he’s able to properly extend himself at toe-off. At 1:00 you can see he still has a pronounced heelstrike but his knees are quite bent so his feet land underneath them rather than way out front. That’s a real improvement. However the heelstrike and the fact that his weight is still behind his foot in midstance are still making running quite difficult, and I have to say that Sylvester Stallone, rather than the character he’s playing, looks like he’s really hurting here. He throws a few punches to cover it up. At 1:31, possibly after a fun day of filming with children, all is well with Rocky Balboa’s running technique. Look how comfortably he runs, no sign of that troublesome heelstrike. Moments later from the front you can see fairly level shoulders and a smooth and appropriate shifting of his head from side to side. He accelerates to a sprint starting at 1:40 and his form doesn’t need to shift nearly as much as on the wharf in Rocky I. There is an odd moment when he temporarily goes back to his heels before shifting again to his forefeet; I think that may be because he’s reorganizing his whole body to his sprinting form, which you can see at 1:57 includes a tucked pelvis. Sprinting is not my area of expertise but I sincerely doubt a tucked pelvis is optimal. Here’s a screenshot showing what I mean. This is also perhaps why, though he’d been jogging along beautifully just moments earlier, he goes back to the forward-back head bob when he sprints. Tucking the pelvis recruits the trunk flexors, and then they’re what’s working. Finally, watch him bound up the steps again from 2:01. A totally different movement from the previous movie. Barely any overstriding, back straight and angled forward, using his extensors–back, glutes, quads, calves–rather than his flexors to get the job done. At the top, not only does his superior fitness mean he still have a ton of energy, but also because he hasn’t been overly flexed coming up the stairs it’s no trouble at all for him to summon a whopper of a jump in full extension at the top. One of the things I love about doing these movie running technique analyses is that the actors both do and do not know what they’re doing when they act through running. I doubt they’re choosing specific joint angles but I’m betting they’re grokking a physical/emotional gestalt, and that has obvious technical consequences that match well with the story. So looking at running technique through the movies lets us consider technique not as a clinical thing, but as a whole-person phenomenon. Yes, Rocky was fitter in the second movie. That’s part of the story and accounts for a number of the differences in his running. But he was also more confident, and that shows clearly in how much less hunched–flexed–he was in the second film than the first. And that has a wealth of running form implications, including footstrike, effort, and pain. I once read about a study in which researchers either critiqued people while they ran on the treadmill or praised them for how well they were running. Guess which group of people performed better and–if I remember correctly–even more efficiently! Naturally the praised group. The commentary dealt with the psychology involved but it also occurred to me how much better the extensor tone is when a person feels good. Better activation of glutes etc. It’s very physical, this psychological stuff. That’s not to say something so simple as that you can fix your running form by changing your mindset. What you do and do not know about movement and coordination certainly are also factors. And, to further complicate things, the physical movement options available to you will also have an effect on what kind of mood it’s possible for you–physically–to have in a particular activity. And so we come back to Rocky, and how much more of all of this he was able to bring to his running in the second movie. More confidence, more fitness, more boxing and training experience, more agility…and thus better running. On the movement front, this lesson will help you move more like Rocky II than Rocky I. The text on the page is about footstrike and in this context that’s very appropos. The lesson addresses footstrike the same way that Rocky’s improved in the second film–with a straighter back and more balanced use of flexors and extensors. What else might you bring to your running in terms of agility and outlook? And how might your outlook affect your movement? I leave these questions in your hands. I loved this article!! Completely agree that the character personality and confidence come through in the two films and affect the running style. Wouldn’t it be interesting to speak with Sly Stallone about how much consideration went into the running clips?!! I’ve just written about my own running form on my website as well as the changes I’ve made to my own running technique and would love to see what you think, though I appreciate you are probably very busy! I’m so glad you enjoyed it, Tim! I didn’t have time to look for info on Stallone’s preparation process for this but I am curious as well. Merry Christmas to you too! In both, he certainly tends to collapse through his right side when weight is there.